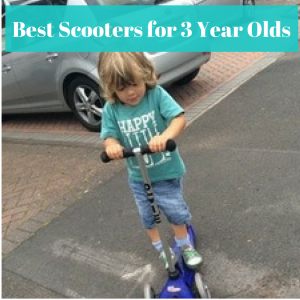 What Are the Best Scooters for 3 Year Olds? Should I get a mini micro deluxe for my 3 year old? The Mini Micro classic or the mini micro deluxe? Are you looking for the best scooter for a 3 year old? Nowadays it can be a minefield as there are so many different scooters at different price points. Are the more expensive ones worth the extra cost? Or will a budget scooter be just fine? In a hurry or just curious? The good news about buying a scooter for a 3 year old is that this is the perfect age to get them a scooter. There are many options available for this age group. They have extra co-ordination and balance that 2 year olds don't have. Being a bit taller than a toddler helps as it's easier to find a handlebar which is the right height for your child. However, the choice available can make choosing the right scooter overwhelming. This article answers your questions and gives suggestions and advice of the best picks. 3 wheels - Most 3 year olds don't have the balance for a 2 wheel scooter yet, so a 3 wheel scooter is a must. Having said this, some children approaching 4 may be ready to get a 2 wheel scooter especially if they've already mastered a 3 wheel. Wheels - Look for wheels made out of high quality materials such as high-grade polyurethane (PU) or urethane. Most first class scooters use high quality polyurethane/ urethane (also seen as PU) as a wheel material as it offers a smooth, less bumpy ride. In comparison, plastic wheels don't absorb as many of the shocks and bumps from the pavement, so they don't offer a such a comfortable ride. Lighweight - a lightweight scooter can be easier for younger chidren to manoeuvre and control especially when they first learn to scoot. A lighter scooter is also preferable for young children as they can pick it up to go up and down kerbs and steps and to change directions. It's also lighter for parents and carers to carry. Deck - decks which are low to the ground are almost always a plus for any age group riding a scooter. If the scooter deck is low to the ground, the pushing leg has to bend less which equals a more comfortable ride. Lower decks also make it easier for 3 year olds to get on and off the scooter. Smooth and Quick Ride - some 3 wheel scooters are designed to be so safe that they are also slow and clunky. Heavy scooters can also be slow. Scooters with very wide decks can be difficult to turn. Features such as these, can make your 3 year old frustrated when their confidence grows as they are unable to get up any speed or turn corners. Look for a scooter that offers a balance of being safe but also the ability to move quickly and smoothly too. The wheels (see above) play a part in this. Read reviews to get a good idea of how the scooter moves. Handlebar height - many 3 wheel scooters aimed at 3 year olds will have a handlebar height of around 66cm which is a good fixed choice as this should be manageable for this age group but leave some growing room too. The optimal handlebar height is around waist height which is the perfect size for them to control and move. At age 3, the main thing to be aware of is that the handlebar is too high for your child. You will be able to see on the picture at the top of the page that the handlebar is slightly too high for my 3 year old son. And this is something you see with many young children riding scooters. Imagine riding a scooter. If the handlebar comes up to your chest then it's going to be more difficult to control. If it's by your thighs, you will have to hunch over to ride it. This is why getting a height adjustable handlebar is advisable as it can be adjusted to the ideal height for each child. Height Adjustable Handlebar - an adjustable handlebar is also desirable so the handlebar height can be increased for children as they grow. This may mean the scooter will last the child longer as long as the scooter quality can withstand a few years of child use. An adjustable handlebar can also be increased or decreased for siblings or friends who may want to have a blast. Make sure the handlebar can adjust low enough (or high enough) to be the right height for your child. Foldable - For young children, a scooter that is foldable is easier to carry when kids have had enough of scooting around. Some scooters aren't foldable but have the ability to take the stem out of the base instead. Folding mechanisms are very convenient but one downside is that they add weight to scooter. So the lightest scooters will not be able to fold. Let's start with reviewing the leading brand of scooters for young children which also happen to be the most expensive, the mini micro. The mini micro have 2 versions of scooters that would be suitable for a 3 year old, the mini micro deluxe and the mini micro classic. Both these scooters have tilt and lean steering, which is meant to be inituitive for first time scooter users to learn. So what are you paying for when you buy a mini micro? And are they better than the other options? Lightweight - ​It's exceptionally lightweight (at only 1.8kg). No other scooter with a height adjustable handebar gets close to being so light. For young children the lighter the scooter the easier it is to control. Children often learn to scoot by picking up a scooter, for example to change direction. And lifting the mini micro is no problem! Even small children can easily lift it up and down kerbs and through doorways. Plus it's light for adults to carry when the kids have had enough. Height adjustable - the mini micro deluxe differs from the mini micro classic in that it has a height adjustable handlebar. The lowest height setting is 43cm (which means it is really good for small children). The highest height setting is 69cm. This means that the handlebar will be the perfect height for each child in the 2 to 5 age range. Well designed footplate - another unique feature is the footplate which is made of flexible reinforced fibreglass. It's super strong but really light and has an anti slip silicone footplate for extra sturdiness. You will notice from the pictures that the footplate is very close the the ground. Not only does this mean it's easy for young children to get on and off the scooter, it also makes the micro much more comfortable to ride. Little ones will not need to bend their leg too low to push along. Handlebar - it's worth noting that the handlebar doesn't fold. The reason it doesn't have a foldable handlbar is that it will add weight to the scooter. The makers want to have something as light as possible as kids find it harder to control heavier scooters. However the handlebar is removable from the base and can be done so quickly. This means you can easily take it on holiday and it's easier to store. Other features - It has an anodised stem which protects the scooter from corrosion. It also has a rear brake for safe stopping. The weight limit is 35kg or 5 stone, 7Ibs. Built to last - the scooters are designed to be durable and last. The key parts of the scooter can be repaired or replaced. This is good as you can easily pass it onto siblings and the resell value is high for these on sites like ebay as well. So it's possible to recoup some of the money you've spend once you've finished using it. It will very much depend on your child and your budget. The mini micro deluxe is designed for children between 2 and 5 years old and 80cm and 110cm high. What you are paying a premium for is that the scooter is lightweight, the telescopic adjustable handlebar that the can adjust to any measuement within the height range specified and the fact this scooter is known to last. It has excellent reviews spanning back the many years it has been on the market, so you know you really can't go wrong. The handlebar has a really low setting which you don't see on many scooters. Therefore if you have a small 3 year old, this could be an excellent choice as the scooter will last them for a long time. Lightweight scooters are easy for children to handle so the deluxe scores highly here. As a child gets older, taller and stronger they will inevitably be able to manage a heavier scooter but this is a great option for starting them off. The mini micro classic has been on the scooter scene for many years. It was Micro's original design for 3 to 5 year olds. Despite being designed may years ago, it's still setting the standard for features on many 3 wheel scooters made today and it's quality and design are unrivalled by most other scooters out there. It's cheaper than the mini micro deluxe and the main reason it's different is that it doesn't have an adjustable handlbar and its stem is made of aluminium rather than anodised aluminium. Apart from that it has many of the features of the mini micro deluxe including PU wheels, a rear brake, a fiberglass footplate and a design that's built to last. 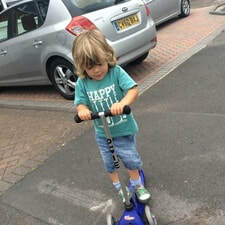 Handlebar height - the handlebar sits at 66cm which is an optimium height for a 3 to 5 year old. Obviously it's not perfect as you can't adjust it perfectly. However, having a height adjusting mechanism would add to the weight of the scooter. And really at this age, the lighter the better. They are both excellent scooters. If you have the budget, the deluxe is always going to be the best choice due to the adjustable handlebar. Even though it is heavier, it is still very lightweight. For a smaller 3 year old, I think it makes sense to go for the deluxe as the handlebar can adjust to quite low heights and will last longer. We bought my son the mini micro classic as the deluxe wasn't availble at the time. You can see from the photo of him that the handlebar comes up a little bit too high, ideally it should be about waist height. He used it daily so it's been well worth the money in my opinion. The 3style is an affordable scooter which has some awesome features for your dollar. The 3style company was set up in 2015 with the aim of providing a well designed scooter at a reasonable price. The features do vary slightly from the mini micro so let's see what you get. Height adjustable handlebar - The scooter is height adjustable from 52cm to 78cm and the handlebar is foldable. There are 4 different height settings at 52cm and moving to 70cm, 74cm & 78cm. This means that it will accommodate your child for many years. 78cm is a lot higher than the maximum height setting on the mini micro deluxe. However the micro has a telescopic handlebar so can be adjusted to any height between 43 and 69cm. Max user weight - The maximum user weight is 50kg so it should last your child for quite a while and older sibings may be able to have a go as well. It has the largest weight limit of the 3 wheel scooters featured on this page so if you think there may be an older sibling that may want to use the scooter, this could be the one for you. Weight of scooter - It's lightweight and weighs approximately 2kg. However it's not as light as the mini micro scooters, which would be easier to control. However, most 3 year olds should be fine controlling the scooter at this weight. Wheels - The wheels are made of PU material for an easy and smooth glide across the pavement. They also have flashing lights for an extra cool factor. The LED lights are also great for being seen during the winter months. If you're not sure to get this one or spend a bit more on the mini micro, check out an indepth comparison of both. The Globber Primo is a popular brand of scooter in Australia and the US. This scooter is a great alternative to the mini micro with some unique features. Steering - the unique thing about this scooter is that there is a button to turn off steering while kids are learning. They can learn to scoot in a straight line first. When they are ready you can turn on the steering. It's a lean to steer steering system like the mini micro. Weight of the Scooter - the scooter is a bit heavier than other choices. It weighs 2.5kg. 2.5kg is fine for most 3 year olds to control but you may want to consider a lighter scooter if you need to carry it a lot (for example when they have had enough scooting). If you're looking for a 3 wheel scooter with excellent features and that isn't too expensive, a really good choice is the zoom cruzer. Handlebar - the handlebar is height adjustable and has 3 settings ( 55cm - 75cm). This means it can be adjusted to best suit a 3 year old's height and will have growing room too. Wheels - The PU wheels offer a smooth ride. The back wheel is extra wide (4.5cm). This gives extra stability and balance to young children. Lean to steer - It is a lean to steer scooter which is easy for small children to master. Just lean left to go left and right to go right. Deck and footplate - The deck has grips which gives that extra bit of stability when riding too. The footplate is wide at 13cm (read more about decks and footplates in this article). This will help young children balance but it also gives a decent footspace for them to use and rest their feet when cruising. Looking for a scooter which stands out from the crowd? The Outcamer could be the number 1 choice for you. Bright colours and LED flashing wheels means that you won't be able to miss little ones scooting around. This can be particularly good for the winter months when it's dark outside. Not for smaller 3 year olds - There are 3 adjustable heights at 77cm, 82cm and 87cm. You will notice that the lowest height is a lot higher that other brands, so it wouldn't be the best choice for small 3 year olds. However, taller 3 year olds and those approaching 4 may be okay. Ideally the handelbara should come up around waist height for a comfortable ride. It's very similar to the mini micro scooter above. It is cheaper than the mini micro but there are a couple of features it compromises on. The iscoot is aimed at kids aged 2 to 5 so will be perfect for a 3 year old. It features an adjustable handlebar so will grow with your child. It has 3 adjustable heights between 55cm to 69cm. It is slightly heavier than the mini micro, weighing in at 2.4kg rather than 1.8kg. Lighter scooters are better for young children as they can manage them better. However, a 2,4kg scooter should be fine for most 3 year olds and you are obviously paying a lot less for the iscoot than the mini micro. Like the mini micro it doesn't fold, but you also like the mini micro you can take the handlebar out of the base for easy storage when needed. ​​Check out more 3 wheels scooters on the 3 wheel scooter page. If you're looking for some lights on the scooter for your child, you have to consider the Ozbozz Cosmic Light Flashing Deck Scooter. It has 3 wheels and some nice features such as PU wheels. It's aimed for kids aged 3 and up and the handlebar is height adjustable to ensure that the handlebar is the right height for child. You can also fold it which makes it easy to store and carry. My eldest son actually had this scooter (at age 3) and it held up well for about a year's use. He loved it at the time especially the lights. It did become a bit rattly towards the end and it doesn't offer the smoothness of ride that the mini micro does. At the time I really appreciated that if folded for practical use. If you're buying a scooter on a budget or expect to replace it sooner rather than later (maybe you have a tall 3 year old who is likely to grow out of it quickly) it could be a good choice. There are many character scooters for little ones which kids this age love because let's face it who doesn't want to pretend to go scooting around like batman. There are both pros and cons to getting one. It really depends what you want to get out of a scooter. If you are interested in your little one getting from a to b quite quickly and smoothly go for one of the other scooters like the iscoot whizz, mini micro or 3 style scooters.If you just want a sturdy, slower scooter on a budget to use outside the home this might make a good choice. Character scooters like the batman scooter featured tend to be cheaper. Wheels: 15cm (6") front wheel and 10cm (4") plastic rear wheels. Steering and speed: the steering is standard handlebar steering. The scooter gives extra stability for beginners but it does go much more slowly than other 3 wheel scooters. This may be good if you are worried about chasing little ones going too fast on their scooters although some children may get frustrated as they get older. Other Considerations - the scooter isn't foldable. It features a colour printed anti-slip footplate. Scooters can be great for young children on the school run whether it be to get them to nursery school or to take their older sibings to school. Scooters are great at getting kids from a to be quickly when you need to. However, there are always those days when your little one just won't budge. I used to then get my youngest son to stand on his mini micro scooter and pull him along by grabbing onto the handlebars and pulling gently. However, I have just discovered the scooter lead. It's basically a strap that you put onto the the scooter and you can use it to pull the scooter along with you little one standing on the deck. It's great when you need to get somewhere quickly and they are going really slowly and won't budge. It also doubles as a carry strap for a scooter so you can carry it over your shoulder.